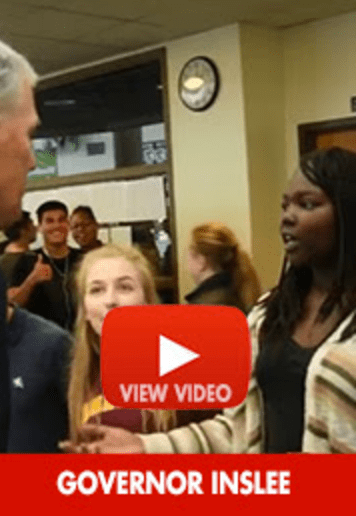 Governor Jay Inslee affirmed the Institute for Community Leadership’s work in Civic Education, Voter Registration for high school students. Rebecca, Ashlin, Isaac, Jose, and Brandon discuss with Governor Inslee their advocacy for Civic Education and Voter Registration for High School seniors statewide. “This is a model for the State!”, the Governor said, affirming their work. The Institute for Community Leadership advocates for more civic engagement education and opportunities for our public schools. We believe that civic education should be promoted. Civic learning prepares students with the knowledge, skills, and mentality they need to be informed and engaged participants in our democracy. → Nuestra Señora Reina de la Paz: Si Se Puede!